LV = County Championship Division One. 'Nottinghamshire v Yorkshire. 'Yorkshire's Adam Lyth celebrates his 100. '9th September 2014. Picture Jonathan Gawthorpe. Former Scarborough CC batsman Adam Lyth and incumbent Test opener Sam Robson both made centuries before retiring in England Lions’ first-day run-fest of 361-4 against an inexperienced Gauteng Invitation XI. In a match also notable for Jonathan Trott’s first return to England colours since the 2013 Brisbane Ashes Test, Robson (109) was quicker into his stride than Scarborough News columnist Lyth (106) after the Lions were put in at the start of their tour-opening three-day fixture in Soweto. Robson, who made a maiden Test hundred against Sri Lanka at Headingley for his adopted country last summer only to finish the season less convincingly, reached three figures this time from 146 balls - having hit 12 fours and a six. 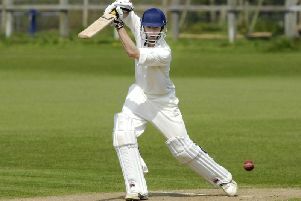 He dominated an opening stand of 176 with Whitby-based Lyth. The Yorkshire batsman will be one of those pushing hardest alongside Robson to open with captain Alastair Cook against New Zealand and then in the Ashes next summer. After England’s World Cup winter, a first full international chance to press those claims may come in three Tests against West Indies in April and early May. Lyth did his prospects no harm in his first innings of the winter by following Robson to a century, his from 168 balls but featuring significant acceleration after taking 129 over the first 50 and going on to hit 15 fours and a six in all. Trott, who has gradually returned to form after his much-chronicled difficulties with a stress-related illness, is Lions captain on tour but could not begin his campaign with significant runs - falling for just six, caught-behind by his opposite number Sizwe Masondo off teenager Keith Dudgeon, who has played just one first-class match. Just after evening drinks, James Vince was only the second authentic departure of the day - caught at cover off medium-pacer Nono Pongolo - but Lyth’s fellow Yorkshire left-hander Alex Lees stayed put from number three to pass a 112-ball half-century. In an unbroken stand of 86 with Jonny Bairstow, Lees finished on 82 - having survived one early chance to short-leg.